We headed to Honolulu Airport laden with bento from Marukai. We are set for the plane ride to Las Vegas. 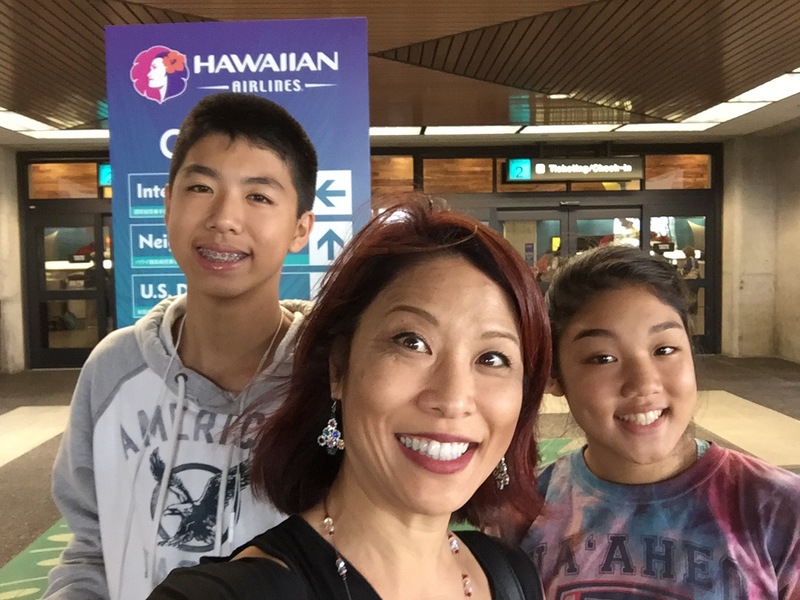 We are looking forward to our Hawaiian Airlines flight that will take us to the ninth Hawaiian island where we intend to eat good food, see some sights, spend time with friends and family, and have lots of fun. We arrived at McCarran Airport after midnight and pretty quickly got our bags. It was slow going after that. The wait for the rental car shuttle was frustratingly long and the wait at the rental car desk was even longer. It was past 2 a.m. when we left the airport with our car. At least checking in to the Orleans Hotel was a breeze. No one else was in line to check in at that time. We went to get something to eat at the 24-hour restaurant (love Vegas!) and finally went to bed at 4 a.m. When we finally woke up the next morning, I made a quick stop at the hotel fitness center and then got ready for the day. We met my brother and his family and went to lunch at In-N-Out. I haven’t had an animal-style cheeseburger in a few years and it hit the spot. After lunch we made an obligatory stop at Trader Joe’s to get some snacks and water. Next, we saw Star Wars: The Force Awakens at the Orleans casino theater. What a great movie filled with action and suspense. I loved it. After the movie we got a quick bite to eat and then took the kids bowling. It was a fun day in Vegas with family. Tomorrow brings the next phase of the trip during which we will leave Nevada and head to California.